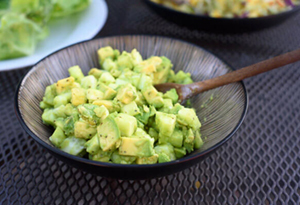 Combine cucumbers, avocados, and cilantro in a large bowl. Stir in garlic, onions, salt, and pepper. Squeeze lemon and lime over the top, and toss. Cover, and refrigerate at least 30 minutes.